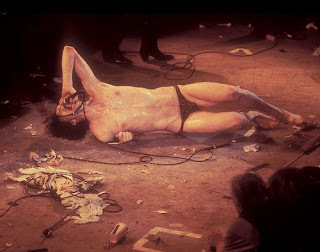 The Cramps’ Lux Interior (born Erick Lee Purkhiser) died this past weekend. My boss at the record store just told me and a few sites back him up. I try not to get too sappy about death — because after a certain point it’s kind of expected; and it’s always inevitable — but The Cramps’ influence really hit me hard while I was in college. Their album Stay Sick is one that smashed me over the head and encouraged me to dig around in the psychobilly genre a bit. Lux was arguably the last in the line of Iggy Pop: frontmen who could make your jaw drop on stage as you fear for their safety, but then go home and write incredible, passionate and beautiful songs at home.